"We really don't plan ahead at all," says 6X vocalist and guitarist Lara Kiang. "We are still just having fun doing this, and that's all that matters really." The group's new Thunder Bomb, the second release from the three-year-old band, is a collection of the kind of music 6X does best: fun, fast and frantic. True to the disc's art work, Thunder Bomb's punky pop features enough explosives to fill a state-line fireworks store. "We wanted this to be like our live show," says Kiang. Indeed, while the band takes pride in their music, they don't put in a lot of time recording it. "The whole thing is just as-is with only one overdub," says guitarist Rob Gal, who also works as a local record producer at his own Snack 'n Shack studio. "We're all busy doing our own things." 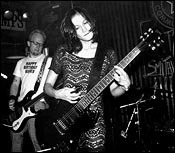 Gal and Kiang began their musical collaboration when Gal joined Kiang's group 17 Years as a fill-in guitarist and ended up staying a while. They started jamming with bassist Kevin Rej and drummer Tim Johnson, and decided to take this new incarnation, 6X, to the live stage. "Like everything we do, it sorta just happened," agrees Kiang. After opening for Bow Wow Wow at only their second gig, audiences began to take notice of the sloppy and good-natured spirit of the band. Gal's wisecracking presence contributes to make each 6X show seem as loose as a party in a rehearsal room. Amy Ray's Daemon Records offered to release their first album, Kung Pow. "We were kinda surprised," says Gal. "Then we were even more surprised when they asked us to do another one." Like Atlanta's version of Nick Lowe, witty producer/musician Gal also has a fondness for odd cover songs. On the current release, 6X thunder through Every Mother's Son "Come on Down to My Boat" and the MC5's "High School." "I like variety and there's something for everyone on this record," he says. "There's stuff on here that's 30 years old and two weeks old." 6X's CD release party is Fri., Nov. 3, at the Star Bar. Copyright � 1996-2000 Creative Loafing Inc.